For those tough-to-clean jobs like microwaves, ovens, toilets, and ceiling fans, you can rely on Sears Maid Services. From your hallways, kitchens, living rooms and dining rooms, Sears Maid Services will display excellent cleaning abilities. Whether you need regular services or a one-time cleaning, we can help. Our local teams have vast experience in commercial and residential areas. You can rely on Sears Maid Services to get the job done right. Give us a call at (317) 577-1090. We know your time is valuable, and we will work with you to set up a schedule that works for you. We can provide weekly, bi-weekly, or monthly cleanings that tailor to a range of homeowner and apartment owner needs. Our staff's schedules are convenient enough to fit with any chaotic daily timetable. If you need a thorough, one-time cleaning once or twice a year for spring-cleaning or to prepare for a big event, we can help. We offer an extensive Deep Cleaning service where you can reap the benefits of a regular cleaning while receiving so much more. Our employees are highly trained in various cleaning techniques to keep any office space free of dirt, grime, stains, and overflowing wastebaskets. You can count on Sears Maid Services to efficiently clean and maintain your office. It's important to clean the space you work in on a consistent basis. Dirty working conditions distract employees from effectively completing their day-to-day tasks. A cleaner environment can boost morale and encourage staff to focus on their work. One of a company's main goals should be to reflect a positive environment to their vendors, employees, and customers. Our professional commercial cleaning service can help you achieve that. Building a new home can be an extremely messy job. After drywall, fixtures, and carpets are all in place, every room will most likely need a thorough cleaning. We can mop, sweep, and vacuum all those problems away. By washing and sanitizing every surface, we will remove all dust and debris from the site. Many construction companies require a cleaning service before they can present a new home to buyers, inspectors, and realtors. Our cleaning experts have plenty of experience with the mess of a newly built home. For all post-construction cleaning needs, you can rely on the professionals from Sears Maid Services. We have such high confidence in our staff that we guarantee high-quality results in your home or business. If you're not happy with our work, feel free to contact us. If you call Sears Maid Services within 24 hours of your last cleaning, we will send someone to inspect any mistakes. If we did miss something, we'll come back and fix it at no extra cost. In addition, we know it is important to be able to trust the workers that you let into your home. That's why we make sure to uphold the highest integrity and employ only the most qualified cleaning experts. Building good relationships with our customers is just as important as doing our jobs correctly. To ensure our success, we make sure every potential employee is background checked and put through an intensive screening process. We have to be sure that there will be no possibility of professional indiscretions. Once we hire someone, they are trained on-site and off-site to help their skills and knowledge grow. 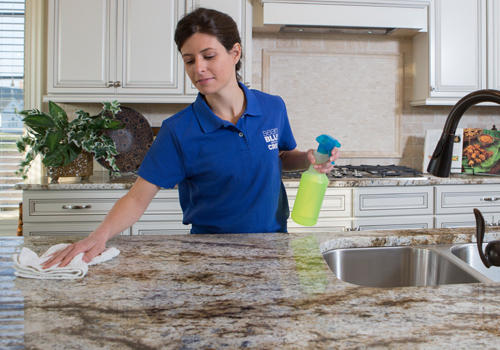 We want our employees to succeed and flourish on the job by providing the highest quality cleaning results.